On Thursday, the operations center for People's E-sports was officially established at the offices of the People's Daily Press in Beijing. A roadmap for People's E-sports industry planning, e-sports industry media strategic planning and the People's Premier League was also released. 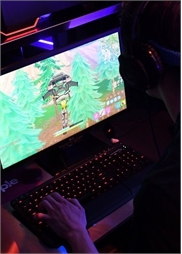 Top video game players gathered in the Polish city of Katowice on Sunday to fight it out on the shoot-'em-up survival game Fortnite, with prize money totaling $500,000 at stake. China is a large country with huge population and obvious gaps in education among people. China's traditional culture is different from that of the Western world, so the country shouldn't simply adopt a ready-made age rating system for games, but figure out its own way. Saturday was a huge day for China in esports as Chinese teams won the world championships at two major gaming events. Chinese esports club Invictus Gaming (iG) became the Chinese mainland's first team to win the League of Legends World Championship by beating out European team Fnatic 3-0 in Incheon, South Korea. Meanwhile, at this year's BlizzCon in the Anaheim Convention Center in Los Angeles, the China team beat out Brazil 3-0 to win the Hearthstone Global Games competition. While talking about the nature of sci-fi and its potential at the recently ended Beijing International Book Fair, celebrated Chinese science fiction author Liu Cixin touched on the future of his globally popular sci-fi trilogy The Three-Body Problem, revealing that a video game adaptation is currently in the works and most likely will release sometime after the film version hits big screens in China. Competitive video gaming, known as eSports, will become a non-medal event at the 18th Asian Games scheduled to be held from Aug. 18 to Sept. 2 in Indonesia. Big-grossing films Jurassic World: Fallen Kingdom and Incredibles 2 again dominated the North American box office this weekend, but two new entrants beat expectations to place third and fourth, according to industry estimates on Sunday. Console makers long at the center of the video game universe are adapting to an exploding constellation of ways to play, with the cloud looming on the horizon. The number of female video game players in China grew prominently over the past year thanks to the immense success of hit mobile games including Travel Frog and Love and Producer, according to a report released by the Chinese game industry data platform CNG in late May. "Where has your frog been?" has recently become one of the most popular greetings among young urban residents in China. Video game giant Electronic Arts on Saturday courted fans with titles such as Star Wars Battlefront and snatched the spotlight ahead of a major industry trade show in Los Angeles. Assassin's Creed, the action adventure adapted from popular video game franchise of the same name, is pinning its last hopes on China, the world's second largest film market and one that especially favors Hollywood action blockbusters. In late 2016, the film seriously underperformed when it was released in North America and other countries and regions outside of China during the Christmas season. The film only pulled in $54.53 million in the US and $157.9 million internationally, far below what it needs to break even on its $125 million budget plus marketing costs. Li Xin, a 29-year-old sales manager based in Beijing, has long been a computer game addict. He started playing video games in the 1990s, and has played over 100 games. Lithuanian entrepreneurs eager to woo Tesla Motors to their shores have built an entire factory to impress the electric carmaker... inside the Minecraft video game.